Laos and Vietnam die each day from waterborne illnesses. In addition, World Agape is installing solar panels to provide rural villages with basic electricity. Empower Entrepreneurs And Families Barriers to entry and lack of capital prevent potential Cambodian, Laotian and Vietnamese entrepreneurs from developing their own businesses. During times of financial hardship, Cambodian, Laotian and Vietnamese families often fall prey to usurious money lenders. With your partnership, World Agape will provide grants, micro-loans, and training to these entrepreneurs and families in order to enhance their lives and their communities. in order to teach Cambodian, Laotian and Vietnamese men and women job and life skills. Our goal is to train them in farming techniques, sewing, parenting strategies, computer skills, business English, and restaurant management. HIV and AIDS are having a devastating impact on Cambodia, Laos and Vietnam. With your support, we will provide testing, education, counseling and treatment in order to stop the spread of HIV and AIDS. We will also provide much needed comfort to the many men, women and children afflicted by this epidemic. 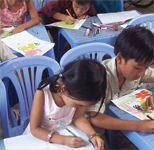 Children living in the poverty-ridden countryside of Cambodia, Laos and Vietnam lack basic education and resources. World Agape is working with indigenous churches and leaders to open and operate schools where these children can learn, grow and thrive. Moreover, World Agape is seeking individual and corporate sponsors to support these children through donations and prayer.